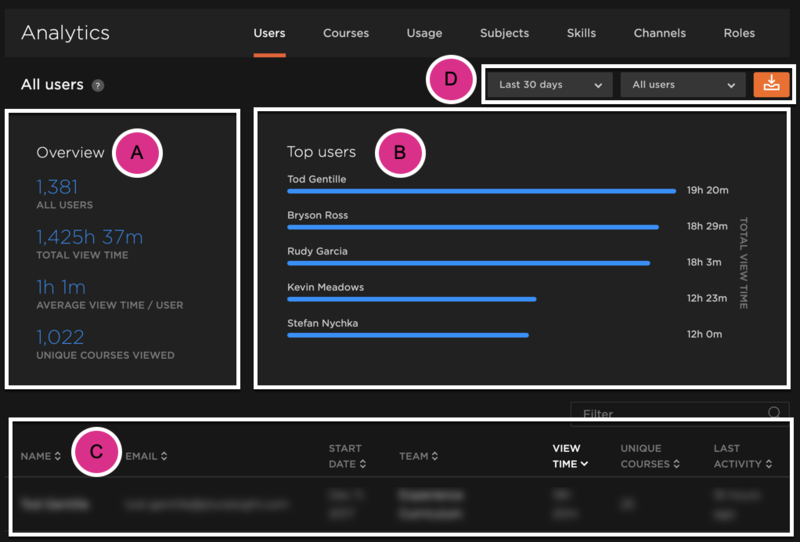 Users analytics shows you a compiled listing of all learners on your team and the time they have spent using Pluralsight. Users analytics is one of the more important analytics sets when trying to engage with data relating to individual activity. You can drill down into a particular individual's activity and see where they are spending most of their time within Pluralsight. Users analytics is also in real-time and will show instant data upon refresh. To get started, log in to your Pluralsight account and click on Analytics using the left pane navigation. Next, click on Users from the top center panel. Alternatively, you can also navigate from the dashboard widget. Click on Dashboard on the left pane navigation and find the Top Users view. Important: Users analytics reports are in real-time. This means that all data is updated as information is updated. Since we don't auto-refresh the page for you, you may need to refresh to get the most up-to-date information. A: The overview section will include high-level data of your team on an individual level. This view takes all of the learning and content taken for your team by each individual and aggregates it to give you a quick reference point of your team. B: The user activity graph highlights the individuals on your team that have the most combined total view time. This view can give you data of the last 30 days, 90 days, or year. If you wanted to check an individual's activity, you can click on their name to take a look. C: In contrast to the user activity graph, this view gives a bit more context around those totals, breaking down the unique courses taken, start date on team, and last activity. From here you can also click into to take a look at the courses viewed by that individual. D: The download report can be toggled between the last 30 days, 90 days, 12 months, and all time and provides a CSV of user totals and data. Learn more about this report in the users analytics report download section below. The user dashboard will give you insight into both course completion rates as well as skill levels (Enterprise only). These can be filtered down to find topical strengths of that individual. 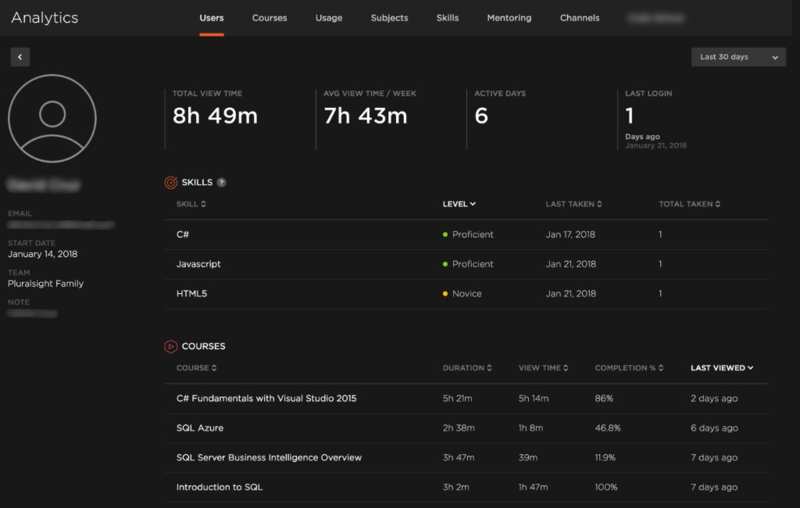 Since many of the analytics dashboards are connected, clicking onto a skill or a course will take you to those respective analytics reports. Important: Due to users' privacy, the skill proficiency level will be shown for Enterprise customers but not the Skill IQ score. Professional customers cannot see proficiency levels. The users analytics report covers many of the particulars related to your team. The report is grouped by user. These include data on viewing (view date), usage (last login, total hours) and redemptions (is on account). A: Start Date: Indicates the time they first logged in. Viewing the following types of content: video courses, interactive courses, projects. The column for LastActivity in the report has the same date per user. This could be a different date than the user's ViewDate column. C: ViewDate: Indicates the last view date of a video course. This is always populated for a user currently on the plan at the time the report is generated, so there may be some delay. Individuals who didn't view any content in this report's timeframe, will show a blank cell in that row. If you download this report in a timeframe that crosses over into another month, the report will have at least one line per month they were in the group plan. D: TotalHours: This represents the total hours (in seconds) for that particular team member. E: UniqueCourses: This column will show the number of unique courses viewed by that individual. This only include courses that are clicked in to play. Courses taken by an individual prior to joining your team will not be included - only courses taken during their time on the team will show here. F: IsOnAccount: Since all users that were ever on your account show here, the available values are True and False. This makes it easier to view only the team members that are active. True indicates the team member is on the account and active. False indicates a member is currently not on the account. Question: How long does it take for the users analytics report to update? Is it in real-time? Users analytics reports are in real-time. All data that is populated is in line with individual usage. As our data doesn't auto-refresh your page, you may need to do so to make sure the data is reflected correctly. Question: Does the users analytics report show only active users? Good question! Users analytics show all users that have ever been on your plan. Now that you've learned about users analytics, check out one of our other Getting Started articles to get the most out of analytics for your team.